Product prices and availability are accurate as of 2019-04-22 10:51:27 EDT and are subject to change. Any price and availability information displayed on http://www.amazon.com/ at the time of purchase will apply to the purchase of this product. 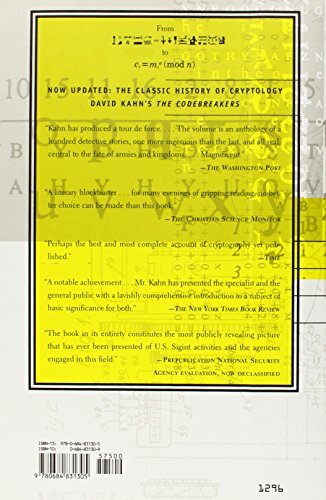 The magnificent, unrivaled history of codes and ciphers—how they're made, how they're broken, and the many and fascinating roles they've played since the dawn of civilization in war, business, diplomacy, and espionage—updated with a new chapter on computer cryptography and the Ultra secret. Man has created codes to keep secrets and has broken codes to learn those secrets since the time of the Pharaohs. 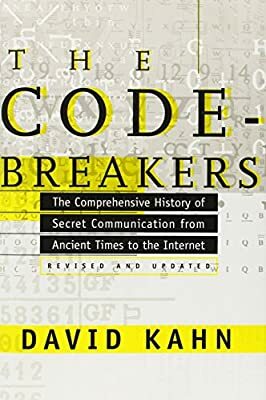 For 4,000 years, fierce battles have been waged between codemakers and codebreakers, and the story of these battles is civilization's secret history, the hidden account of how wars were won and lost, diplomatic intrigues foiled, business secrets stolen, governments ruined, computers hacked. From the XYZ Affair to the Dreyfus Affair, from the Gallic War to the Persian Gulf, from Druidic runes and the kaballah to outer space, from the Zimmermann telegram to Enigma to the Manhattan Project, codebreaking has shaped the course of human events to an extent beyond any easy reckoning. Once a government monopoly, cryptology today touches everybody. It secures the Internet, keeps e-mail private, maintains the integrity of cash machine transactions, and scrambles TV signals on unpaid-for channels. 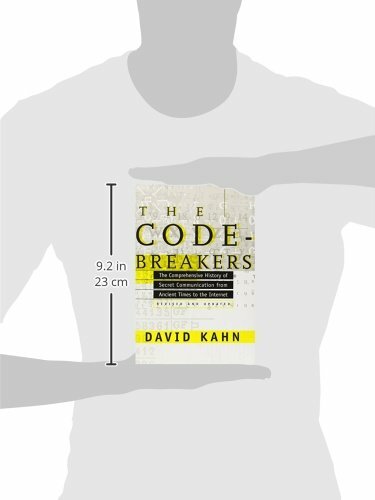 David Kahn's The Codebreakers takes the measure of what codes and codebreaking have meant in human history in a single comprehensive account, astonishing in its scope and enthralling in its execution. Hailed upon first publication as a book likely to become the definitive work of its kind, The Codebreakers has more than lived up to that prediction: it remains unsurpassed. With a brilliant new chapter that makes use of previously classified documents to bring the book thoroughly up to date, and to explore the myriad ways computer codes and their hackers are changing all of our lives, The Codebreakers is the skeleton key to a thousand thrilling true stories of intrigue, mystery, and adventure. It is a masterpiece of the historian's art. "Few false ideas have more firmly gripped the minds of so many intelligent men than the one that, if they just tried, they could invent a cipher that no one could break," writes David Kahn in this massive (almost 1,200 pages) volume. Most of The Codebreakers focuses on the 20th century, especially World War II. But its reach is long. Kahn traces cryptology's origins to the advent of writing. It seems that as soon as people learned how to record their thoughts, they tried to figure out ways of keeping them hidden. Kahn covers everything from the theory of ciphering to the search for "messages" from outer space. He concludes with a few thoughts about encryption on the Internet.